"No one pitied him as he would have liked to be pitied." As Ivan Ilyich lies dying he begins to re-evaluate his life, searching for meaning that will make sense of his sufferings. In "The Death of Ivan Ilyich" and the other works in this volume, Tolstoy conjures characters who, tested to the limit, reveal glorious and unexpected reserves of courage or baseness of a near inhuman kind. Two vivid parables and "The Forged Coupon", a tale of criminality, explore class relations after the emancipation of the serfs in 1861 and the connection between an ethical life and worldly issues. In "Master and Workman" Tolstoy creates one of his most gripping dramas about human relationships put to the test in an extreme situation. 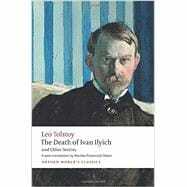 "The Death of Ivan Ilyich" is an existential masterpiece, a biting satire that recounts with extraordinary power the final illness and death of a bourgeois lawyer. In his Introduction Andrew Kahn explores Tolstoy's moral concerns and the stylistic features of these late stories, sensitively translated by Nicolas Pasternak Slater. Nicolas Pasternak Slater has translated several works by Boris Pasternak, most recently The Family Correspondence, 1921-1960 (Hoover Press, 2010). For Oxford World's Classics he has translated Lermontov's A Hero of Our Time. Andrew Kahn has written widely on Russian literature. His books include The Cambridge Companion to Pushkin (2006) and Pushkin's Lyric Intelligence (OUP, 2008, pbk 2012). For Oxford World's Classics he has edited Pushkin's The Queen of Spades and Other Stories, Montesquieu's Persian Letters. and Lermontov's A Hero of Our Time.